Officially licensed by the University of Utah and featuring a foreword by the "Voice of the Utes'" Bill Marcroft, BCS Breakthrough: Utah's Historic 2004 Season takes you game-by- game through the Utes' compelling 2004 season with game stories, player and coach features including in-depth stories on Head Coach Urban Meyer and Heisman Trophy candidate Alex Smith, game and season stats and a behind-the-scenes look at how Utah overcame tremendous odds to forge a triumphant path to their first Bowl Championship Series game in school history. The full-color, commemorative hardcover also includes an eye-popping 24-page section on the Utes' historic appearance in the Fiesta Bowl featuring game photos and stories, as well as coverage of all the team functions and bowl events leading up to the big game! 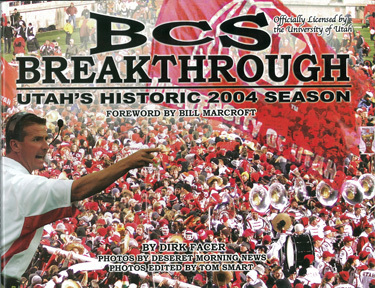 BCS Breakthrough: Utah's Historic 2004 Season is unquestionably the most comprehensive review of one of the most unforgettable seasons in Utah football history. A valued addition to any Utah fan's personal library.